Joan is startled when she finds a strange man in her house, but the situations begins to feel all too familiar. 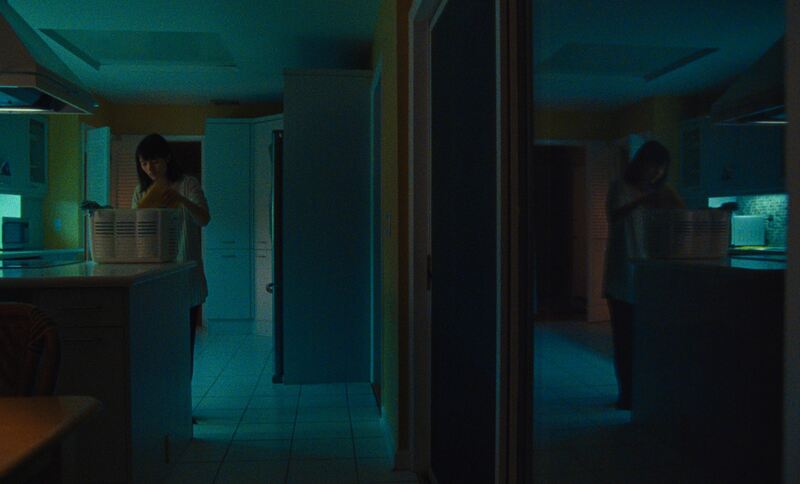 A dark mysterious short that’s haunted me ever since I first saw it at the 2017 London Film Festival, Parker Hill’s Homing In is the unsettling tale of a young mother who finds a strange man in her home. With a Horror-esque set-up, Hill’s inventive seven minute film playfully skips between genres, all the time keeping its audience hooked with a building intrigue, a sense of dread and an impressive production. Inspired by a fascination with the suburbs, Hill was out shooting for a photo series called ‘Little Boxes’ when a phone call with her grandmother sparked the initial idea for Homing In. “She told me that back in the 50’s, the houses in Levittown were so identical that people would go home and go inside the wrong house”, Hill explains. “I thought that was hilarious and kind of tragic, and I knew the concept would be ripe for a dirty realism-toned short like a Raymond Carver short story”. Shot on super 16mm film over 2 days up in Westchester, NY, Hill and her crew have created a timeless, atmospheric aesthetic to tell the story of Joan and her mysterious intruder. Featuring some textured cinematography, it’s easy to see how the film was inspired by the director’s photo series, with every shot in the film feeling like it could easily be paused and turned into a still. However, Hill’s aesthetic approach wasn’t all about just ensuring her film looked good, with the director admitting she really wanted to use the visual side of things to tell her story. “This film was really the first time that I focused on the visual side of storytelling more than anything else”, says Hill. “I learned so much in the process. Directing on film kind of requires a slightly different discipline than shooting analogue stills, and while I’m happy with how this film turned out, I know I can do better next time. Along with publishing Homing In online, Parker has also recently released a fascinating profile doc about actor/photographer Jason Lee on Vimeo, called Sanderson to Brackettville. Next up for the director, she’s currently directing a couple of music video, before working on a new photo series this summer.